Weather can cause all kinds of issues for roofs and gutters. Unfortunately, after most severe weather events, unless the damage is obvious, very few people examine the roofs of their homes or businesses. This is a mistake that could cost you a lot of money in the long run. Many areas are seeing more severe weather than ever before, making increased awareness of your roof’s condition more important than ever. Any kind of weather – rain, snow, hail, sleet or high winds – has the potential to cause roof damage. Some roof damage is easy to spot, like fallen trees or roofs blown off. But not all storm roof damage is easy to spot. Some damage from severe weather can be harder to spot or completely hidden from casual observation, but it can cause problems later under the roof or in the interior of the building. Here are some kinds of roof damage to watch for after severe weather in your area. Downspouts/Gutters – Hail and wind can loosen and bend gutters and downspouts, especially if they are older, in poor condition or not securely attached. Heavy rain can wash debris and dirt into your gutters. Once gutters become clogged, they no longer carry water away from the roof and building, potentially causing backup and water damage to the roof or interior of the building. Heavy debris will also cause gutters to sag; putting undue stress on them and further loosening them. Shingles – Severe wind can lift and even rip shingles off the roof, especially if the roof is older and the sealant stripping is no longer holding well. If your roof has shingles that are cracked and missing, melting snow will create stress on your roof due to the weight; as well as possible leaks as the snow melts. Water Damage – Rain, snow and other forms of long-term moisture from severe weather can create expensive repair issues as well. Rot, mold or rust may appear on the walls near where the roof meets them or around transitional metal barriers that join parts of the roof, call flashing. Moisture can build up in these areas over time with multiple weather events, even if they are mild ones. Unrepaired or severe water damage may cause damage to the interior of the building. 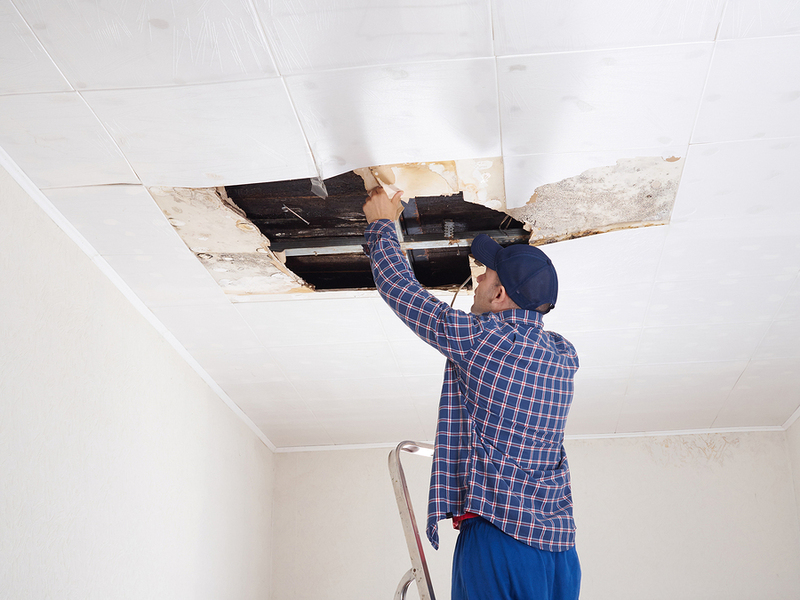 Water Spots – Check the ceilings of your home or business after a weather event. Do you see any damp rusty colored rings on the ceiling? This is usually the sign of a roof leak. To avoid further problems that can become more expensive as the leak worsens and spreads, contact a professional roofer immediately to assess the damage and make repairs. Dark Stains – Various stains and discolorations in the attic could be a sign of mold that has developed in areas poorly protected from moisture. This issue is sometimes caused by poor roof sealing and can be exacerbated by a lot of wet weather. If layers of the roof are starting to lift, water may be getting into the attic with each rain, hail or snowstorm. 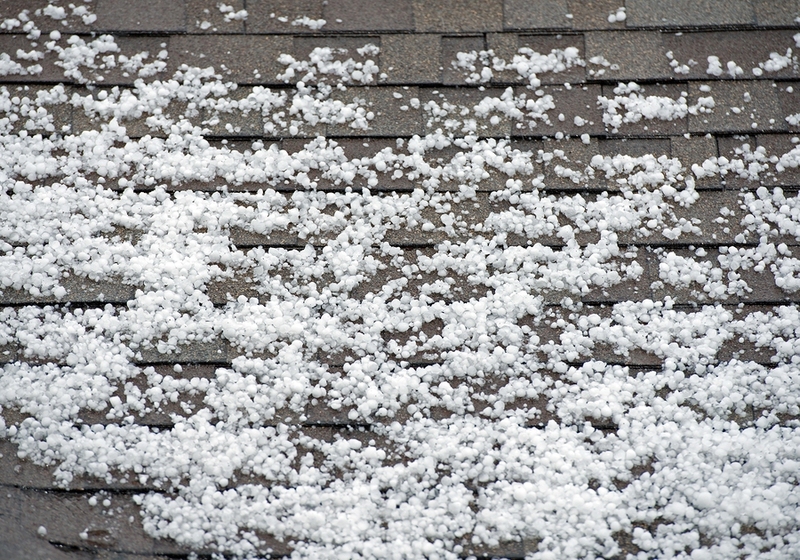 Holes in Roof – Storms that produce projectiles, such as sleet, hail or very heavy rainfall, can give your roof a pounding. If your roof is older, this type of intense weather can actually punch large or even small holes in the roof. Some of these holes caused by storms may be not be easily seen without a close inspection. 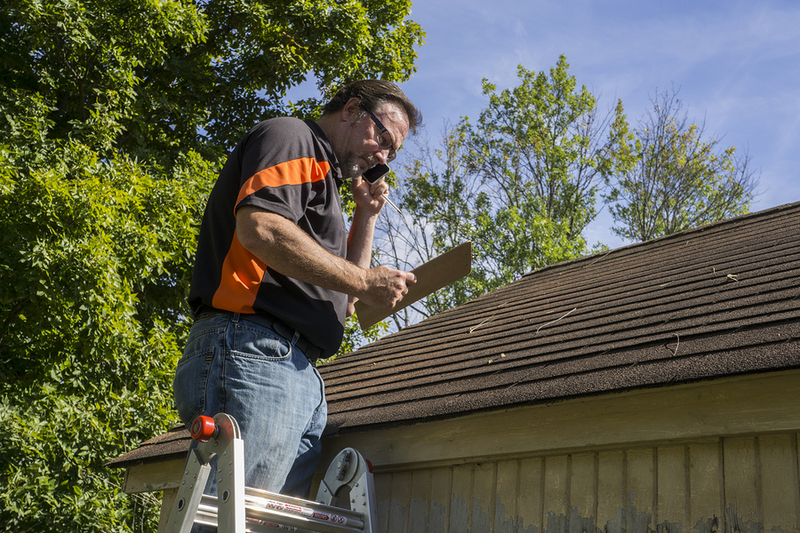 If you live in parts of the country where severe weather events are more than a rare occurrence, your roof is probably in need of an inspection. Catching and repairing damage early will save a lot of money down the road. Here in Las Vegas the end of the spring rainy season is the perfect time to check your roof. Contact a roofing contractor who will be able to provide an inexpensive, professional assessment of your roof, rain gutters, attic and all the related parts that make up the roof’s protective shield. 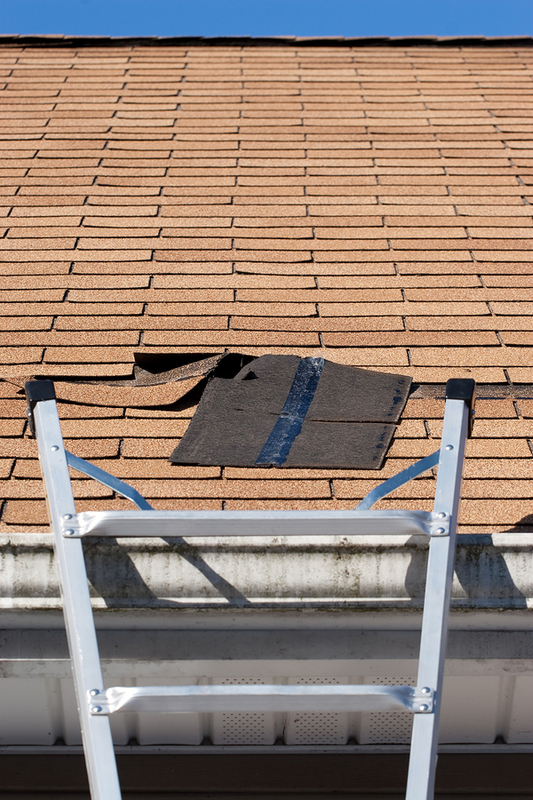 If your roofer does identify storm damage, get a written estimate for the needed repairs. Then, contact your insurance company. 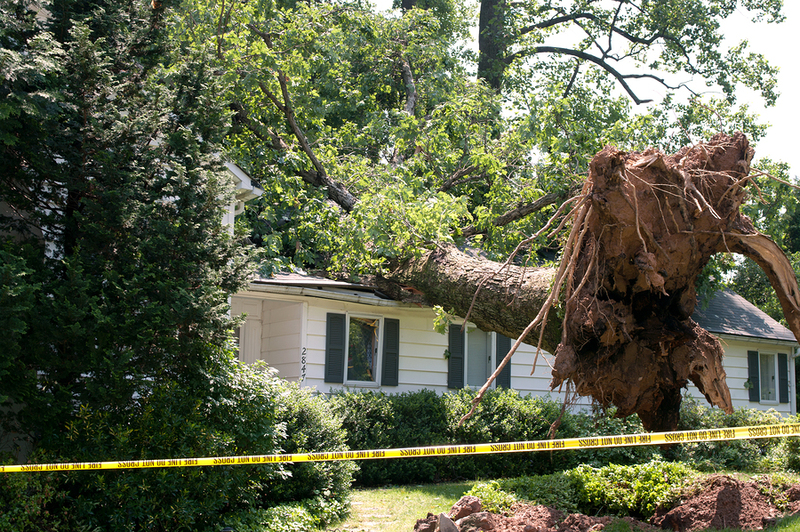 Depending upon coverage, your insurance company may reimburse you for storm repairs. Be sure to have a written checklist, photos and an estimate to show your insurance provider. A well-designed roof will last for years but even the best designed roofs can take a pounding from storms and other severe weather. Take the time to get a roof inspection today and be ready when the next big storm comes to town. 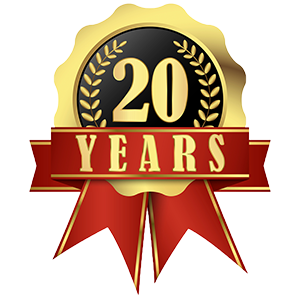 The History of Roofing Materials What Questions Should You Ask Your Roofer?